Regarded as one of Australia's leading screen composers and acclaimed internationally, Burkhard Dallwitz was born in Germany and began classical piano ﻿training﻿ at the age of eight. In 1979 he travelled to Australia, and a year later became a permanent resident. In Melbourne he studied music at Latrobe University where he majored with Honours in Composition. Since 1984, he has worked as a composer for feature films, television and commercials. 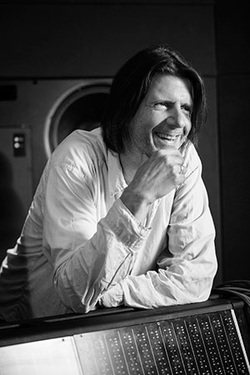 ﻿Over the years Burkhard has been the recipient of several APRA/AGSC Screen Music Awards and nominations and in 1999, he was awarded the Golden Globe for Best Original Score in a Motion Picture for The Truman Show. This score also won the Chicago Film Critics’ Award and the ASCAP Film and Television Award, and the soundtrack reached number two on the Billboard charts. In 2001 he won the APRA award for Best Television Theme for the 2000 Sydney Olympics and In 2004 he won the APRA/AGSC Screen Music Award for Best Music for a Television Series for CrashBurn. Burkhard also received two nominations in the 2006 APRA/AGSC Screen Music Awards for the Australian feature film The Caterpillar Wish. In 2008 he was awarded the APRA/AGSC Screen Music Awards for Best Music for a Television Series for Underbelly and Best Television Theme for It’s a Jungle Out There. Other recent scores have included the European feature film Manipulation, starring Klaus Maria Brandauer (‘Out of Africa’, ‘Mephisto’) and Sebastian Koch (‘The Lives of Others’, ‘The Black Book’), and the international Mini-Series False Witness, a Screentime Production for UKTV starring Dougray Scott, Claire Forlani, Rachel Blake and Richard Roxburgh. In 2009 Burkhard scored the second series of Underbelly: A Tale Of Two Cities and then composed the score for Peter Weir’s feature film The Way Back starring Colin Farrell, Ed Harris, Jim Sturgess and Saoirse Ronan. He also received two APRA/AGSC Screen Music Awards nominations for his work onFalse Witness and Underbelly: A Tale Of Two Cities. In 2010 Burkhard received an ARIA nomination for Underbelly: Original Television Soundtrack Album and an APRA/AGSC Screen Music Award for Best Music for a Television Series Underbelly: The Golden Mile. In 2011 he was nominated for Feature Film Score of the Year for Peter Weir's The Way Backand won the Screen Music Award for Best Music for a Mini Series or Telemovie for his score for Underbelly Files: Tell Them Lucifer Was Here. 2011 saw him complete several overseas and local productions, among them the 4th series of Underbelly: Razor. In 2012/13 Burkhard scored two 8 part Television Mini-Series, Underbelly: Badness and Underbelly: Squizzy, as well as the feature length documentary Red Obsession. He also won the 2012 Screen Music Award for Best Music for a Television Series for Underbelly: Razor making it his fifth award in as many years for the Underbelly franchise. In 2013/14 Burkhard scored the new 9 part Television Drama Series Fat Tony & Co as well as receiving an AACTA award nomination for Red Obsession (best sound for a documentary) and two Screen Music Award nominations for his work on Red Obsession and Underbelly: Badness. In November 2014 Burkhard won the Screen Music Award for Best Television Theme for Fat Tony &Co. In 2015 Burkhard scored the highly acclaimed and multi award winning ABC Mini Series The Secret River directed by Daina Reid and produced by Ruby Entertainment's Stephen Luby. His score for The Secret River won the 2015 Screen Music Award for Best Music for a Television Mini-Series and was also nominated for the 2015 AACTA award for Best Original Music Score in Television. A busy 2017 saw Burkhard score the big budget Chinese/Australian feature film The Longest Shot as well as the critically acclaimed SBS TV drama series Sunshine which won the 2017 AACTA award for best tele feature or mini-series and the 2 part mini-series Underbelly Files: Chopper for the Nine Network. Burkhard has several soundtracks out on general release and lives with his family in Melbourne, Australia. He continues to work on local, European and U.S. film and television productions. Burkhard Dallwitz is a multi-award winning screen composer in a career spanning over 30 years.